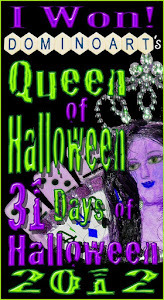 Blackdragon's Crafts: Day #22 of the 31 DAYS OF HALLOWEEN and TELLENS PLACE....plus extra! Day #22 of the 31 DAYS OF HALLOWEEN and TELLENS PLACE....plus extra! 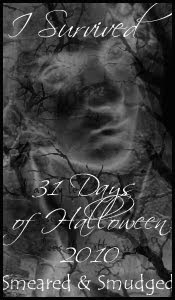 Welcome to day #22 of the 31 days of HALLOWEEN and TELLENS PLACE new challenge which is 'BUTTONS'. I have made a bag.... its about 10x12 inches to store HALLOWEEN treats for the kiddies. I used 'BOO EDWARD ' coloured with promakers, 3 of CHARLENES buttons , paper from my stash and some fuzzy black cord. Very simple but my girls love it! I hope you can play along this week..... click on my title to visit TELLENS PLACE. Just for good measure to today i thought i'd also share with you WICKED hoppers this fat book page.... i used inkadinkadoo and non sequitur stamps..... i like the idea of an angel and bats! .......and this atc..... the main image is STAMPOTIQUE.... again its all coloured with ink. I love the quirkiness of these stamps... and must use them more often! 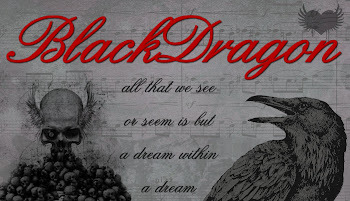 Thank you for visiting me today... see you tomorrow for day #23.... the WICKED BLOG list is still at the top of my side bar. WOW!!! three gorugous projects!!!! wonderful job on all!!! Wicked SWEET!!! All of them! Wow what wicked projects! You're on a roll. BD, all of your projects are brilliant! Wow, love them all! The bag is super cute, the angel is lovely even with the bats and that ATC rocks. So many wonderful things to look at!!! I too, love bats and angels! And crows and angels as well! Great job with all of your fabulous projects! These are all awesome as always best bud. Fabulous projects, of course I love the ATC and coloring with ink? I'm going to have to check that out. What's not to love about this collection of masterpieces.... Nothing! It's all fantastic!!! wow what great stuff..I love the angel with wings and that ATC is awesome and I love the halloween bag!